…and that suprise was 2 quarts of strawberries from our friends at Finger Pickin Farms. We went out and picked about 72 quarts to share with CSA members, bring to market, and to turn into delicious treats for ourselves! We brought every member 2 quarts. The other new addition was garlic scapes. We brought just three of these delicious fresh garlic flavored treats. They are actually the flower of the garlic plant. We think they are delicious raw or cooked in about anything. We brought the third variety of kale for the year. This week it was Lacinado Kale, also known as Dinosaur Kale and Tuscan Cabbage. Its an italian variety that is a little sweeter and more tender than the other two varieties we’ve brought out. We made a delicious white bean and kale soup out of it this past weekend. Scallions: more of the delicious green onions. 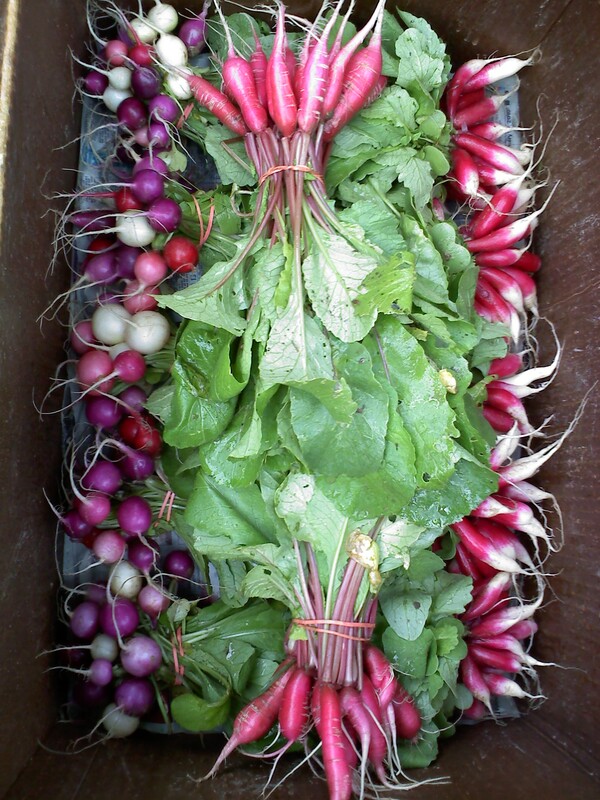 Radishes: You should have gotten Easter Egg or French Breakfast, whichever variety you didn’t get last week. Both are mild, crisp, and sweet. The three radish varieties we've had this year: Shunkyo in the middle, Easter Egg on the left, and French Breakfast on the right. 2 heads of baby lettuce: A green leaf variety called Tropicana and a red butterhead variety called Skyphos. 6 ounces of Salad Mix: A wide variety containing baby summer crisp lettuces, baby chard, baby mustard, baby kale, and a significant amount of baby arugula. 3 heads of Pac Choi: These are still holding up really well. We brought 2 more Black Summer and 1 more Joi Choi. If you don’t know how to use all this Choi and haven’t tried Crystal and Paul’s ginger sauteed recipe, let me second the recommendation!